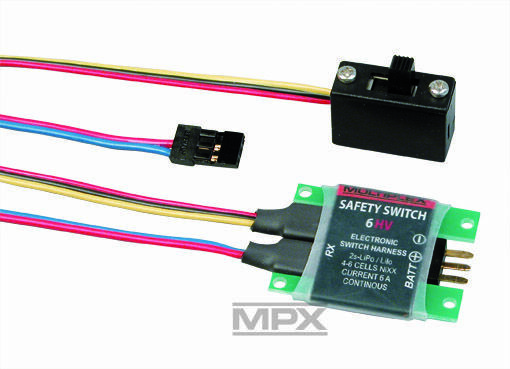 MULTIPLEX SAFETY-SWITCH High Voltage (HV) switch harnesses are the ideal solution for the safety-conscious model pilot. 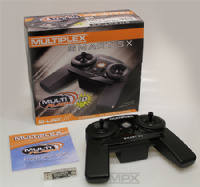 The receiver battery (4 - 6 NiXX cells or 2S LiXX) is connected directly to the SAFETY-SWITCH circuit board. The actual switching function is carried out by reliable, high-performance FETs which are immune to vibration; they also feature very low internal resistance for ultra-low power losses. A conventional mechanical slide-switch acts as the ON / OFF switching element; this makes it easy to see the operational status of the circuit. However, if a fault occurs in the slide-switch or its connecting leads, the electronic circuit always maintains the last active switched state (i.e. ON or OFF). This means that the receiver power supply circuit remains switched on even if the switch lead comes adrift in the air (e.g. due to vibration), i.e. the receiving system continues to function. If you use one of the TwinBatt types in conjunction with a telemetry-capable M-LINK receiver, both receiver battery voltages can be monitored at the transmitter. 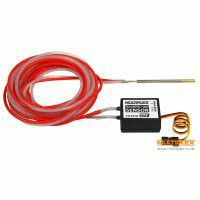 The MULTIPLEX SAFETY-SWITCH 6 HV represents the safe, low-cost alternative to conventional switch harnesses.